Born and raised in Seattle, Washington, the majority of my life has revolved around celebrating nature through my lenses and protecting wild ecosystems from greedy, destructive schemes. These traits have taken me deep into the raw and pristine beauty of the outer west coast of Canada, and surprisingly to the exotic biodiversity of the Big Island of Hawaii. I continue to advocate for the protection of the earth's life-sustaining ecosystems, wild habitats, and its creatures through my work. My sixteen year sidetrack to Hawaii's Big Island ecology, history, and culture lead to some wonderful and exciting photographic possibilities; Hawaii it is a place of great passion and inspiration. On the bragging front my images have been wildly used the world over by movie productions, TV broadcasts, books & magazines, DVD & CD covers over many decades. 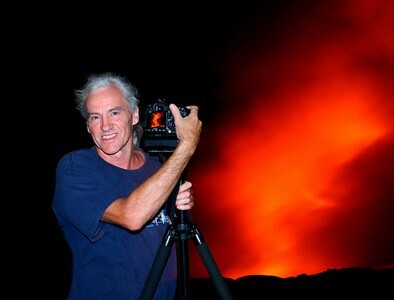 Having one of the largest inventories of high-definition, extreme molten lava action video of Hawaii Island’s eruptive Kilauea Volcano, my footage is highly sought after; appearing in documentaries and TV specials such as NBC-Universal, National Geographic, and dozens of other productions in countries the world over.